HARRY N. MACLEAN LIVE SATURDAY ON TRUE CRIME UNCENSORED! Edgar Award winner Harry N. MacLean returms Saturday 2pm PT/4pm CT/5pm ET/10pm UK to True Crime Uncensored! Listen Live on Outlaw Radio by clicking this link! 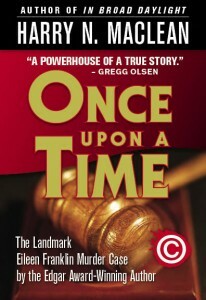 Once Upon A Time, A True Story of Memory, Murder and the Law. By Harry N. MacLean Now available in e-book: at crimerant.com. In 1989, Eileen Franklin, a young California housewife, claimed to recover a repressed memory of her father killing her playmate 20 earlier. In a landmark trial, the father was charged and convicted of first-degree murder, based solely on his daughter’s testimony. This book chronicles the trial, explores the remarkably dysfunctional Franklin family, and delves into the reliability of repressed memory as evidence in court. This version contains a 2011 Epilogue, which details the reasons for the reversal of George Franklin’s conviction and the refusal of the district attorney to retry him for murder. Steve Martini, author of Compelling Evidence, wrote: “A tragic but gripping story, and expertly crafted. Mr. MacLean has a positive talent for detail, and an obvious knowledge of the law. I congratulate him on a masterfully told story”. Nancy Taylor Rosenberg, author of Mitigating Circumstances, wrote: Once Upon A Time is a well-written and meticulous account of a true human drama. . The author’s objective viewpoint in presenting these facts makes for a compelling and challenging read. . The uncharted terrain of the human mind and its ability to repress as well as deceive are fascinating food for thought. Burl Barer (Fatal Beauty) and Howard Lapides (Celebrity Rehab) host True Crime Uncensored produced by Matt Alan.